I used almost the same gear on Finnmarksvidda as on last years long skitrip in Sarek. Some things were different and here are my comments and idiosyncrasies on those. I see no need to rehash this since I tend to repeat myself unconsciously enough as it is. What I will focus on here are the things that differed. If we look at what was worn, two things were different on Finnmarksvidda. The thin fleece gloves were lost last summer and replaced by a pair of synthetic running gloves from Craft (35 grams). I had a hard time finding something suitable since I was looking for really thin gloves. The reason is that you have the gloves on almost all the time, day and night, when it is cold, and you need to be able to do almost all things with them on. Also, when you are skiing and exerting yourself, even thin fleece gloves will keep your hands warm. If they do not, I simply pull my old pile mitts on top of the gloves. I do not like wool/merino gloves because they wear out too fast (1-2 days might be enough for your fingers to poke through in places. Also the good qualities of wool are in my opinion more or less wasted on your hands. Fleece is excellent and dries fast, which is paramount. Also, I have yet to use a fleece glove with any kind of membrane that is not extremely difficult to dry out. So I stay away from those like the plague. Thin, hardwearing and quickdrying is what works for me. The Craft gloves I did not like. They were not durable, threads ripping all the time and they felt clammy and un-dry even when they were reasonably dry. Joe was using thin RAB Power Dry Gloves and they seem great. I will buy a pair shortly. The gas canisters were not Primus but Beaver gas, since we both flew in and had to buy the gas in Alta. There was no choice of different brands. We brought two canisters with 230 grams gas each, plus 1 backup. I used the Micron stove and Joe the Primus Spider. I know that I use 75 grams gas per day in winter (25 grams in summer) for the kind of cooking I do. Primus gas that is. I did not feel that Beaver gas was considerably less functional, but have a hunch that the propane fraction got used up a bit faster. But this could be due to temperatures and a number of factors, so I cannot say anything more definite. It could simply be prejudice. We had a bit of gas left in all canisters and quite a bit in one. From this it is obvious that we used all canisters because on occasion they were lacking in zap when they got low. If you had used the Spider at all times with the canister inverted this would likely not have happened. However, I certainly would not use a Spider inside my tent with an inverted canister because of the risk that it flares up, so I am all with him on that one. We did keep our canisters in our sleeping bags at night and in our 'pelican pockets' all day, except when using them of course. I see no need for any other type of stove for ordinary winter use than a top mounted canister, but if you want to play it absolutely safe, go for a Spider or some other stove that will let you invert the canister. The BPL Windscreen in titanium foil has gone to meet it's maker. Still the best windscreen I have used. If anyone knows where I can find something similar please let me know. Instead I used a slightly heavier homemade alumininium screen (35 grams). Most cooking was done in the tents, so the windscreen did not see much use. It was usually also shielded by the Snow Claw and the rulk when cooking outdoors. Instead of Stil woolies (210 grams) I used a pair of micro fleece long johns (225 grams). They are thicker and warmer and I do not feel that the wonderful capacities of wool are as useful on the legs as on the torso. I believe that the micro fleece long johns that I put on after my brief visit in the Mattis river worked better than the woolies would have done underneath my soaked Paramo trousers. My old, if not ancient, Woolpower undershirt (260 grams) was replaced by a Peak Performance Lite Micro (210 grams). Stock photo above, mine was grey. This might seem a bit odd considering my ravings about wool on the torso. There was however a thought behind it. Summer and winter I use a thin merino shirt as a base layer. In winter it is the BPL hoody, which is a perfect piece of garment in my opinion. 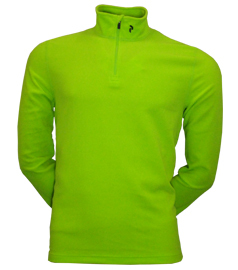 Before turning in for the night, and sometimes a bit earlier in the evening, I switch to a dry baselayer. Last year it was the Woolpower, this year it was the Peak Performance. I cannot honestly say that I noted any difference, which I did not expect since I do not exert myself nor sweat much while sleeping. Hence, wool is not really that necessary. The night shirt is also my extra baselayer. Usually, even when it is pretty cold, I ski only in the BPL hoody and my Paramo Velez smock. But sometimes when it is cold and/or windy I need an extra layer on top of the hoody. For this purpose I suspected the micro fleece to be less prone to get damp from the outside and less compressible, offering a better, or at least equal protection compared to the Woolpower. The PP performed as expected, but I cannot honestly say that it was better or worse in any way than the Woolpower would have been. It was 50 grams lighter however, but would not have been as good as a true baselayer while skiing. However, considering that I fell into a river and got my BPL merino partly wet/damp and still saw no need to change it (I could have put the PP as a baselayer and dried the merino on top after my swim, but was sufficiently confident in the merino not to do this) it is difficult to imagine a situation when I would have been forced to use the extra baselayer as a ... true baselayer. This year I did not bring the homemade snow anchors simply because I forgot them. I thought they were attached to the tent and forgot to check. They were not needed, since I could use the rulk and skis as extra anchors, and had the lines used to attach the pack to the rulk as extra guylines. I guess it also says something about the capacity of the Firstlight tents even without the extra guylines. Not brought was the Garmin Geko, which stopped functioning a week before we left. I considered buying a new GPS, but wanted to try a software with my phone instead. This took some doing on the day before we left, but I managed to find a freeware for geocaching where I could enter some waypoints. So my HTC phone doubled as GPS receiver. Also new this year was a cover for my skis. Usually I travel by train, use no cover and tie my skis together with duct tape that I re-use after the trip. But plane travel made a ski cover necessary. We had planned to leave some stuff at a locker in Alta airport, which we did, so the ski cover stayed there. But in case I had to bring it on the Vidda I made a very light cover from scraps of cuben fiber and silnylon. 42 grams is pretty light. It picked up a small hole or two in flight, but nothing serious. I can use it again a couple of times before patching. Before putting my skis into the cover at Alta I plundered the waste bin for long strips of bagage claim stickers that I twisted and use as a sort of rope to tie the skis together. Ultralight? That is about it. I'm beginning to feel pretty confident in this type of gear for winter trips now, and also feel that I have proven that I do not need 30 kilos worth of gear. Neither did Joe, so I guess it is not only me. "And I do not want to be called a gram weanie..."
Thanks for posting. Very interesting run-through of your winter gear. If I didn't already own the Akto I would definitely look into the Firstlight as a 4-season shelter. The simplicity of it is very appealing and the quick and easy pitch. It is of course lighter too :). I read your chapter about socks the other day and I think your system is very sensible and I will try it this season. Just wondering if an extra pair of thick wool socks would have been helpful in the situation you were in?. Got the power dry gloves from Rab myself some weeks ago. Funncy coincidence :). I'm surprised they were usable in the conditions you were in, they're so thin. Good to know that they're a good pick as a liner glove in winter. I plan to try a combination of power dry gloves, normal fleece gloves and the MLD event mitts. Those PowerDry gloves were awesome, they basically didn't leave my hands for seven days apart from trips to the cat hole... I carried two pairs with the intention of rotating them as they got wet but they dried out so quickly that I didn't bother. I wore the spare pair once I think, when I momentarily mis-placed my main pair which also highlighted the need to possibly always carry a spare pair of liners (they only weigh 30g). 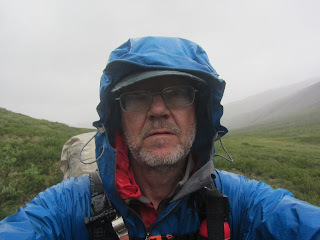 Like Jorgen I wore a pair of membrane-free over-mitts (Montane Extremes). I also carried a pair of Buffalo mitts as our 'back-ups' which were nearly needed when Jorgen thought he'd lost his Helly Hansen's. Turns out they had packed themselves away with his tent. Yeah I have been looking for a really thin pair of fleece gloves, so will check the Rab ones out. I have been using a pair of Extremities Windy Lite Dry Gloves which are nice though a little thin on the palms, the backs do stop the wind though. It is always nice when you feel that your gear list is pretty much settled, I must admit I feel mine is getting close these days as well. Certainly Smarter Backpacking has been helpful in this regard. :-D I am often introduced as a gram weanie and I always say: No, I am a kilo weanie. You're a light packer yourself, so you know that there are kilos to be saved, and that is what is interesting. Gram weanie is an expression used by some to belittle what we do, and by others more thoughtlessly, because it is a funny expression. The reason I am a gram weanie on the subject of windscreens is simply that if a titanium windscreen does not weigh less than something I can make myself much cheaper from thick aluminium foil, I do not think there is much point. I am a bit unsure in what way you think another pair of socks would have helped, but basically the answer is no. Once your footwear is wet, or soaked as in this case, it is useless to put a pair of spare dry socks into them. They will also become wet in a couple of minutes. In my mind the only way, as long as you are outdoors and do not have access to a fire, is to dry the socks and the boots with body heat. It is even more important in winter, when everything wet will freeze solid unless itis on your body. I made this mistake of soaking my pile socks (brought to wear outside my dry woolies for warmth at night; Joe used ID Hot Socks)when I got out of the water. This made the pile socks useless frozen boards for the rest of the trip. I had to use my Helly-Hansen mitts on my feet at night instead. So I still think that one pair of "wet socks" that you wear while hiking and one pair of religiously-kept-dry-night-socks is good combination. I see your point, it just seems like a miserable situation to be in, being out in very cold conditions with wet feet. How do you think gore-tex socks would work in those conditions? Would the socks wet out anyway due to perspiration? But, yes, I guess we are all aiming for a system of gear and techniques that functions well. My system functions well for me right now. Then there are of course always lighter gear, but that is only progressive improvements. Has the holy grail finally arrived, something that is both absolutely rain proof and breathes well. In that case I would have to change my system. I imagine these feelings are pretty common among people who are not in to lightweight, but has a functioning system and do not want to change that, but find it easier argue against new ways of thinking. Yes, at the time I thought a pair of Goretex socks (which I use in summer) would have been helpful. I probably would have donned the pile socks and Goretex socks and stuck my feet into the wet boots. I think this combination would have kept my feet reasonably warm and dry. This might infact be the best addition to my gear list in the future. Yeah the Tumalo review got me thinking too, I have the original Golite Virga, which I used the other day in cold, damp and moist conditions, I was surprised how cool I felt. Mind you I was not exerting myself too much either with only a day pack on. 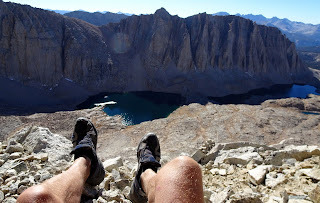 Hmmm, thinking about Jorgen's dip and subsequent foot issues, I think Thomas has a very good point about carrying some Gore-Tex socks as back-up. It's not an intuitive decision, "My ski boots are Gore-Tex lined so why do I need to carry my waterprrof socks?" seems like a perfectly reasonable argument. An interesting point to raise Thomas. Roger, the Rab PowerDry gloves are minimalist. They won't keep the wind off and they are thin all over. This means they dry fast and are very dextrious but they need an over-mitt in cold and windy conditions. If you want a little bit thicker gloves there is another nice Polartec material called Power Stretch. It's thin fleece with a woven side out, which makes it more durable and probably takes some wind too. Marmot has a pair of Power Stretch Gloves that weigh around 40 g.
They are my outdoor gloves at the moment, but I haven't used them enough to know if the stand the test. Martin, you're right, PowerDry is BRILLIANT as a baselayer material. It's grid-side-in construction really does pull moisture away from your skin. The MEC hoody I wore as a base-layer on this trip was a heavier PowerDry than my gloves which were the lightest weight of the fleece. PowerStretch is a good choice too. It's definitely the most comfortable of Polartec's fleeces and is good for gloves (again, I use Rab). When there is lots of wind and not too much cold I opt for gloves made with Polartec WindPro. The best wind resistant fleece out there. No membrane no no sweating. "I see no need for any other type of stove for ordinary winter use than a top mounted canister, but if you want to play it absolutely safe, go for a Spider or some other stove that will let you invert the canister." I have to disagree. I'm a strong proponent of white gas stoves in winter. And use inside a tent is safe enough with a proper system. The system will end up heavier but in my opinion it is the way to go on long trips in very cold environment. IT enables also a warm tent, some gear drying possibilities and fast snow melting (mostly needed for groups of 2-3). But my reason to go heavy is that like you, I don't want to have too much doubles in my gear closet and thus I'm using the expedition gear also in Scandinavian winter. So I don't say that "summer gear" couldn't be used also in winter. I agree with Joe on the stove thing. However, if I went to Svalbard for three weeks in winter and wanted a really proven system I would probably go for white gas as well. All the pros you have mentioned are valid in the situation you have described. However, most of us, me included, do not venture on expeditions like that, so for that reason I find it valuble to have tested and be able to say to people using even top mounted canister stoves: Do not believe people who say that they cannot be used in winter. 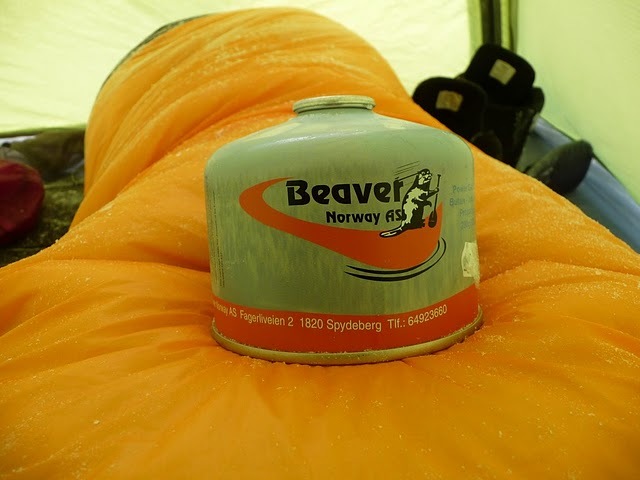 For most winter camping, if you keep the canister in your pocket and sleeping bag it will work very well and you do not need to buy a white gas system. Jörgen, I appreciate your experiences and proven systems very much and especially the fact that you share them in a very nice way! And I agree with you that if you already have something that works, it is pointless not to use it. The latter seems to be my (and many others?) besetting sin: It's always nice to buy and try new gear that might be exactly the best thing some niche job even though it wouldn't be really necessary. The wording "I see no need for any other type of stove for ordinary winter use than a top mounted canister - -" was just a bit on the strict side so I though to comment on it. But it all depends on the starting points and aims. Yes, the gist is and the wording should be that "for myself I see no need for any other type of stove for ordinary winter use than a top mounted canister..". Everyone must make their own choices among the available alternatives. I do of course find it interesting to search alternatives to techniques that are so established that you are not really allowed to question them, a k a holy cows. And when you do question them you have to tread very carefully, because the reactions you get proves very clearly that they certainly are held 'holy' by some people. This said in a general context, it is not directed at your comments.